Slowly, timidly, the sun set over the Hudson River. Thousands of people had gathered in the World Financial Center, soon to be renamed Brookfield Place, to see an 87-year-old, diabetic black man play a six-stringed instrument he had named “Lucille.” When the backing band took the stage and played its way through a few instrumentals, stretching out seemingly in an effort to prove its worth to the audience, anticipation growing to a fever pitch. The band’s tight transitions and familiarity with the changes in direction one member would make in leading the others, all the while acknowledging the formidable vacancy at center stage. Somewhere backstage, the object of everyone’s curiosity and adulation waited, allowing time for credit to go where it was due before bedazzling the audience. Surely, by Howlin’ Wolf’s logic, swirling around in the back of his grey-spotted head were thoughts of evil. The best kind of evil: channeled, concentrated, harmless but evocative. It’s a different brand of evil, one which foregoes fire and brimstone in favor of lamenting over women and tube amplifiers. To do what he does, night after night, at this age? Something deep inside of this man is much stronger than I, and many of us mere mortals, can ever hope to be. To great fanfare, the legend took the stage. Like the fading sun above us, he set out slowly, though not timidly, and took his rightful place at the throne to survey his kingdom before embarking on another great quest to capture the hearts of the heartless, cosmopolitan suits and sundress-clad womenfolk. Riley B. King, better known to the world as B.B., had yet to play a note by the time he had accomplished his mission. “I’ve been wanting to do this most of my career,” he said. “Come out here and play a few blues for you. My, there are some fine-looking ladies here tonight!” And with that, he was off and running, all the while sitting perfectly still, save for the magical motions of his dexterous digits. His band, tight as ever, kept a close watch on the man himself, stopping on a dime and rolling back the volume when he asked. His mid-song interludes extended for minutes as he begged the crowd to sing along to “You Are My Sunshine” and “Sweet Sixteen.” When they did, he smiled and launched into solos and fills featuring the elastic vibrato and sharp, bright tone which brought him to the vanguard of blues music and has kept him there for more than sixty years. His seeming need to connect with every individual member of the audience raised the spirits of those in attendance and gave credence to his reputation as a gregarious performer and generous man. It is nigh impossible to gauge B.B. 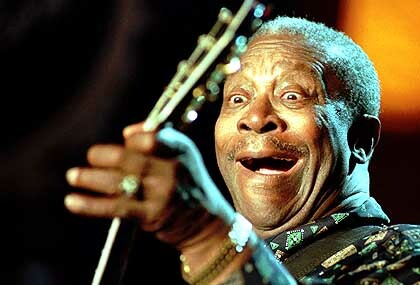 King’s influence on blues music since he first recorded music in 1949. From the cotton fields of Mississippi, he took the reigns of electric guitar wizardry first displayed by T-Bone Walker and ran with them like a blues balloon high over his head. At least in part courtesy of King, the blues gospel found disciples in the likes of Eric Clapton, Duane Allman and Jimi Hendrix. His style of playing proved to be highly influential, as it shunned million-notes-per-minute solos, such as those of “sheets of sound”-era John Coltrane, in favor of paced musical economy. King’s solos can consist of five notes for four bars, eleven for eight and twenty for sixteen. His trademark black Gibson ES-355 is capable of incredible sustain, something which bled over to arguably the most influential English blues album of all-time, John Mayall’s Blues Breakers With Eric Clapton. From there, the blues-rock revolution hit full stride, with its John the Baptist smiling from afar.